Researching, and eventually purchasing a used vehicle is a very difficult task. With the weight of having it for multiple years, you want to make absolutely sure that you are getting all of the ideal features for your lifestyle, at a price point that fits your budget. Because there are countless used vehicles available in every class imaginable, you want to get all the information you can to be an informed consumer. Luckily, Certified Autoplex of Carrollton, just outside of Dallas, is here to help, by highlighting various vehicles we have in our inventory. Here, we will be giving details on the Buick Enclave. In its century of production, Buick has long been known as the epitome of American luxury cars. In particular, the Buick Enclave is one of the most luxurious SUVs available on the market. It has all of the practical and reliable elements that drivers have come to expect from an SUV, while at the same time having numerous added luxury features. Continue reading for our available Buick Enclave models and their features. 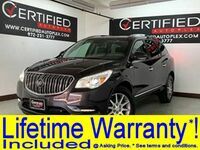 If you are in the Carrollton TX or Dallas TX area and are considering the Buick Enclave, you can follow the link below to our inventory. We currently have three available models of the used Buick Enclave, being the 2017, 2016 and 2014 models. Despite them not being from the same year, these three vehicles actually have numerous features in common. Let's take a closer look at some of their features. Many people often assume that luxury cars are lacking in performance, but this is definitely not the case for the Buick Enclave. The 3.6L V6 engine in the Buick Enclave generates an impressive 288 horsepower and 270 lb-ft of torque. With power like this, it is not a surprise that the Buick Enclave can tow up to 4,500 pounds. The Buick Enclave also has an incredible amount of space, even for an SUV, making it perfect for larger families. The Enclave has a third row of seating, for a total of seven seats. Additionally, with all the seats folded down, the Buick Enclave has up to 115 cubic feet of total storage space. Between this, and the towing capacity, the Enclave is perfect for moving, camping and a number of other uses. Finally, would the Buick Enclave really be a Buick if it didn't have some great luxury features to it? Some of these great luxury and convenience features include leather heated seats, blind spot monitor, rear camera, 10-speaker Bose premium audio system, available Wi-Fi hotspot, touchscreen navigation and much more.